Now that summer is over (judging from the view out of my office window...) it's time to start thinking seriously about antiques and collectors fairs again. Despite the attractions of better weather and balmy days spent looking around outside stalls, summer fairs sometimes suffer from slightly poorer attendance than those at other times of the year. Our experience is that the period from now until Christmas is usually one of the best times to buy at fairs, despite the shorter days and worse weather. Are Fairs Worth The Effort? Visiting a fair often involves rising unsociably early on your day off and then driving some distance, paying admission and walking around in the cold. It's not always a tempting prospect - especially as websites like ours and the behemoth that is eBay make buying antiques and collectables online so easy. Despite this, fairs do still offer a number of real benefits to collectors - whether new or experienced. 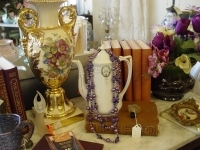 Aside from being an enjoyable day out, fairs give you the opportunity to see and handle a wide range of pieces. Hairline cracks, worn gilding, restoration and healthy signs of genuine age can all be seen 'in the flesh'. Different materials and decorating techniques can also be much more clearly understood - as can subtle but important differences like whether a pottery's mark is over or under the glaze. On the other hand, when buying at fairs the principle of caveat emptor normally applies. It's essential that you check pieces over carefully yourself before agreeing a deal. Don't be content with the dealer's description of its condition - look out for restoration, damage or wear, and other problems such as mismatched or missing lids and saucers. Knowing which fairs are on when isn't always easy and we often get emails asking for fair details. The secret, as always, is knowing where to look. The Antique Trade Calendar - an A5-sized, quarterly printed guide to virtually all of the antique and collectors fairs in the UK. Indispensable for planning buying trips. It costs �1.50 per copy and if you can't find it locally, you can call them on 020-8446 3604. So if you�re planning to head out hunting, have a look at one of these two guides; we hope you find them as useful as we do.